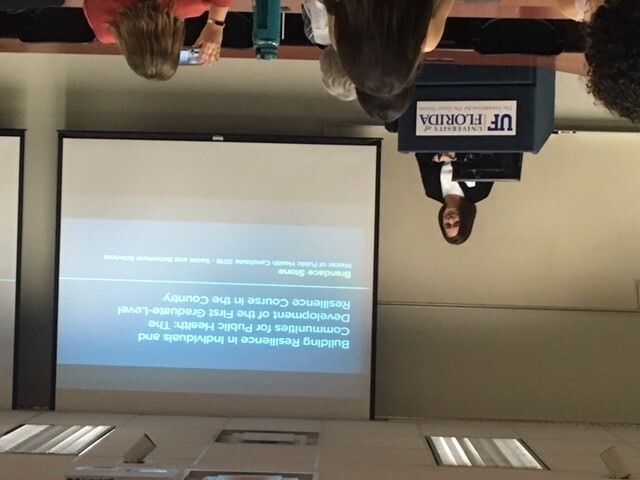 The University of Florida has just rolled out the First Graduate-Level resiliency course in the country. This is a significant step in the trauma-informed movement and Peace4Tarpon’s collaboration and support played a pivotal role in making this happen! The University of Florida has fostered a strong relationship with Peace4Tarpon, through the College of Public Health and Health Professions, for a few years now. Recently, the conversations between the two were focused on how they could partner to take the aims and methods of the trauma-informed initiative beyond Tarpon Springs and into a more accessible, formal format. This sparked the idea to create a course available to learners who can take the information and spread the culture of trauma-informedness and building resilience no matter their location. For students to be able to plan and implement trauma-informed and resilience-building programs, they also need to have a foundational knowledge of public health programs design. Additionally, it was thought that a course on trauma-informed public health and one on building resilience would best to provide a thorough analysis of the topics. The necessary nature of the three courses together led to the development of a nine-credit graduate certificate titled “Trauma-Informed Public Health” within the College of Public Health and Health Professions. The course was designed with the educational theories of constructivism and connectivism in mind, as students are called to create their own products from given information and grow their resource connections via technology. Following the Center for Disease Control’s Socio-Ecological Model, the course moves from defining trauma and resilience, to the individual, community, and larger societal level resilience programs described in the literature. While seminars and workshops on trauma and resilience are available to learners, these courses comprise the first graduate-level curriculum of its kind. The online distance-learning format allows students all over the world to engage in learning about resilience and the positive impact related initiatives can have on individual and public health. The University of Florida is excited to roll out these courses in the next few academic semesters, so please keep an eye out for registration if you are interested in obtaining a graduate certificate in trauma-informed public health!